It just doesn’t get better than this. 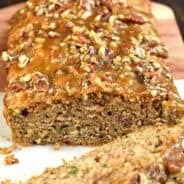 I have tried several kinds of zucchini bread, and while I love this bread, it just doesn’t compare. My mom’s recipe is the best. It is filled with flavor! I am really enjoying the zucchini I am harvesting this year, and I’m trying out new recipes, but the majority of the zucchini I harvest will be baked up into this yummy bread. I then wrap each loaf in foil and stick it in a ziploc freezer bag marked with the type of bread. We will then enjoy this bread all winter long. I hope you love it too! Mix all ingredients thoroughly. Pour into two greased loaf pans. Bake in a 350 degree oven for one hour. I like to line the bottom of my loaf pans with parchment paper just to be sure that they come out easily! Remove and let cool. Enjoy warm (I like a small pat of butter on my bread). Mmm, nothing like a great family recipe. So perfect! 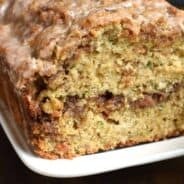 I’ve been looking for a zucchini bread recipe all morning. This one sounds wonderful. I love family recipes, they are so special. Oh I have never thought about adding in raisins! How dumb of me?….I love raisins! Aunt Sandy, I have made 4 loaves already, with more on the way!!! Christina, I hope you enjoy, it really is so good. Can’t wait until my zucchini ripens and I can make some bread. This looks fantastic! I found your weblog web site on google and test a few of your early posts. Continue to maintain up the very good operate. And keep sharing delicious dishes. Nice addition of raisins and pecans, plus a generous dose of nutmeg … no wonder it tastes so good! Will definitely try your Mom’s recipe. I’ve never made zucchini bread before but am excited to give it a try. Do you peel the zucchini before grating? 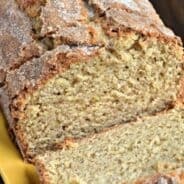 I love breads that can be frozen and enjoyed all year, and zucchini breads are my favorite. Definitely will be giving your mom’s recipe a try!